The Commodity Futures Trading Commission (CFTC) is in a bit of a tough spot. Being subject to the federal government shutdown meant shutting down the various Commitment of Traders (COT) reports for all the products listed on the exchange. There are a lot of them. Though the government and therefore the CFTC has reopened, it is going to be some time before they catch up (assuming they can before the next shutdown). The plan is for two releases per week in chronological order until that gets them up to date. The CFTC restarted last Friday filing its numbers for the penultimate week in 2018, and then yesterday completing last year. Though it still leaves January 2019 unfilled, it’s a start and it does get us the data about how futures markets behaved during December’s tumultuous weeks. For crude oil futures, money managers threw in the towel then found someone else’s and threw in theirs, too. This class of futures market participant, who before Euro#3 was almost alone in setting WTI’s price, was near record long as late as the second week in July. And while doubts only grew during last summer, they held on until around mid-September. The big purge started the same time the oil crash did. Whereas MMGR’s were net long 430k contracts in early July 2018, it was still just about 300k long the first week in October. By the first week of December, the aggregate position had collapsed to just 100k. The lowest point was 67k net long two weeks after, and still only 78k to end the year. It wasn’t just the capitulation, it was the speed at which it happened. 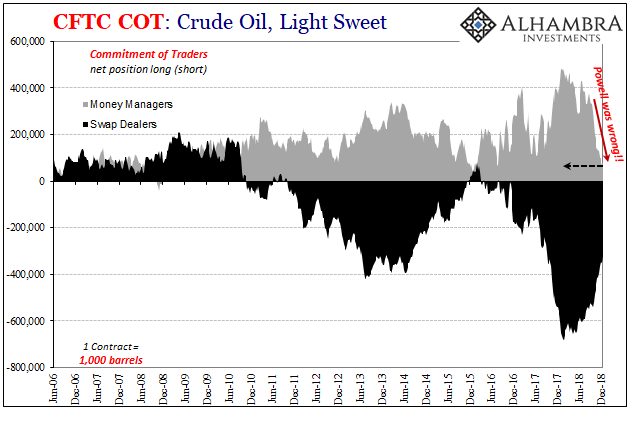 Managers haven’t been this unsure about crude since the dark days of late 2015. The reason for their sudden anxiety and fear is obvious. Out of nowhere (not really; money and economic warnings have been ignored in the media but that doesn’t mean they didn’t occur or that people with actual skin in the game hadn’t noticed them), crude oil stocks began to rise.